The Orbi Home WiFi System , Orbi is the World’s First Tri-band WiFi System. From your front yard to your home office to your pool, Orbi gives you reliable, secure, and crazy fast WiFi to every inch of your home. No more dead zones upstairs, no dropped connections through walls, just WiFi everywhere. The Orbi Home WiFi System reaches up to 5,000 square feet through WiFi barriers like walls, stairs and doors using dedicated Tri-Band technology. Need more coverage? Just add an Orbi Satellite to instantly expand your WiFi System and reach. 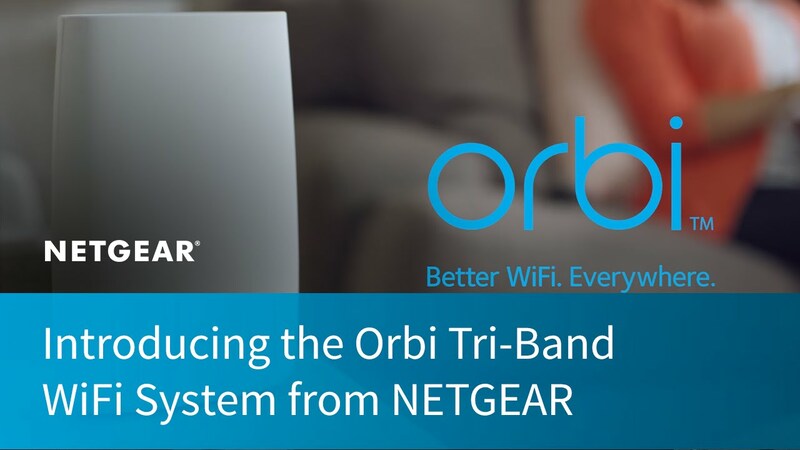 Orbi is the only Home WiFi System using dedicated Tri-Band technology. Other, first generation WiFi systems use dual band and mesh technology which can slow down your WiFi speed as you add more devices, or even more mesh units. Orbi provides a dedicated third band that provides a congestion-free path from your device to the Internet, even as you add more Orbi or WiFi devices. No, other mesh systems and range extenders slow your speed as you add more devices or mesh units that compete for the same bandwidth. Through the use of our High Power Amplifiers, Orbi provides greater coverage and faster speeds than the generation 1 mesh systems and range extenders and creates a single high speed network for your entire home. Buffering shouldn’t be a part of family movie night. Orbi helps prevent buffering and lag by creating a high speed Internet superhighway for all of your devices. Orbi Tri-Band WiFi System works with your current ISP’s modem to maximize the speed you are paying for, to every inch of your home and beyond. Orbi’s sleek design and state-of-the-art technology steals the show. While other WiFi systems need at least 3-4 units to cover your whole home, Orbi gets the job done with 2. ..Netgear Orbi delivers in spades, quite literally solves the problem of dead spots and it does so with uncompromising performance. What’s in the Box (RBK50)?